Honey bees have remarkable mouth parts. Since their natural home is a hollow tree, they have the ability to shape wood with their mandibles. When a swarm of honey bees moves into a cavity in a hollow tree, the worker bees clean up the inside of the tree. They chew away any loose particles of wood. Beekeepers can take advantage of this wood chewing ability in a technique for combining two colonies of bees into one hive. If the beekeeper simply combines two colonies, the bees are likely to fight. The result is the death of many bees. The fighting can be avoided, and the bees can be united to become a single colony occupying the hive by separating the two original colonies with a sheet of newspaper. As newspaper is made of particles of wood, the bees can chew through the paper over a period of several days. While the bees are chewing the paper, they begin to get accustomed to the odor of the other colony. By the time that the paper is perforated, the colony odors are blended into one. In the photo, you can see where I am combining a colony having a young, laying queen with a colony which has lost its queen. The queen-less colony is under the newspaper; the queen-right colony is on the top. While moving the strong queen-right colony, I used a double screen board as a temporary cover to provide plenty of ventilation for the bees. This screen arrangement at the top will be replaced with normal covers. Care must be taken to ensure that all of the bees have adequate ventilation until they have had time to chew through the newspaper. Here at Peace Bee Farm, this method of re-queening colonies is almost always successful. I was looking for information about this technique. You make it seem fairly easy. I have a top bar hive that I need to requeen, and a new bird house full of a hive that I want to requeen and combine with the other hive, all into a new Langstroth hive. In this case, would you recommend requeening the top bar hive first inside the main box of the L-hive and then using the newspaper method with the bird house bees after removing their queen and putting them in a honey supper above the main hive box? I am a beginner, so any advice you can give will be appreciated. Thanks. I’m glad that you found the newspaper technique for combining hives of interest. It is especially useful for combining two hives or for re-queening a hive. Your project looks like it will be quite fun. Let me suggest that it may be quite difficult to re-queen the colony while it is in a bird house, because comb in the bird house is not removable like frames in a Langstroth hive. A workable solution for your combining project may be to take it in steps. You can transfer the bees from the bird house fairly easily by placing it on a bottom board and inside an empty hive body. Above the bird house place another hive body filled with frames of drawn comb. The bees will move up over time and occupy the frames in the upper hive body. 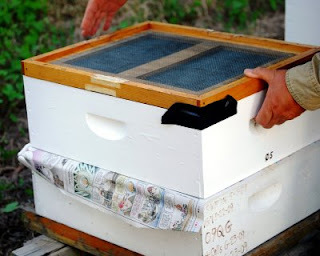 This works especially well if you can borrow a frame of open brood from another hive and place it in the center of the upper hive body. If you place open brood in the top, nurse bees will move up immediately, drawn by brood pheromones. Place a feeder in the hive, and feed the bees during the transition. Check the upper hive body periodically. Once you find eggs in the frames of the upper hive body, you know that the queen has moved up. Now, place a queen excluder below the upper hive body to keep the queen from returning to the bird house. After a brood cycle of 21 days, you may remove the lower hive body with the bird house. You have now transferred the bees from the bird house to a Langstroth hive. You are now ready to combine the two hives together. This works well if you separate them with a sheet of newspaper. It does not matter which colony goes on the top. After three or four days the two colonies should be combined. With the two colonies now combined, you may re-queen using a single queen. Make sure that you de-queen this combined colony at least 24 hours before introducing a new queen. Otherwise, the bees will probably reject it. An easy way to re-queen is to place a nucleus colony with a good queen above the queenless colony, separated by a sheet of newspaper. In the time that it takes for the bees to chew through the sheet of newspaper, they will have gotten accustomed to her odor and pheromones. The entire colony will then be organized around her pheromones. April, I’m posting a picture of a bird house filled with honey bees that I transferred to a Langstroth hive. It was an enjoyable experience, and it produced a productive hive. Good luck. Best wishes. The bird house holding a feral colony bees may be viewed at http://peacebeefarm.blogspot.com/search?q=bird+house.